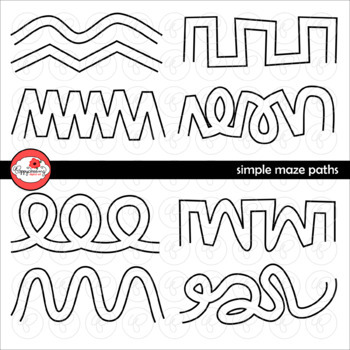 Simple Maze Paths Clipart – Nine (9) maze paths to help your youngster with his/her fine motor skills. Also great for creative writing and story telling (beginning, middle, end). High quality, 300 dpi, png images with transparent backgrounds. Paths are transparent, each just under 11" long to fit lengthwise on 8 1/2 x 11 paper. This is intended for use by one teacher in their classroom. It is not to be redistributed to an entire school or district. It may not be redistributed or sold online or other. You MAY use these designs in unlimited ways for personal classroom and personal crafting and creative projects including creating worksheets, bulletin boards, activities, readers, digital scrapbook layouts, craft items, etc. You MAY share finished projects that you create in online galleries, blogs and websites. Plus if you send me a link to what you create, I will cross-promote your shop on my social media outlets! Thanks for shopping and please contact me if you have any questions!! !